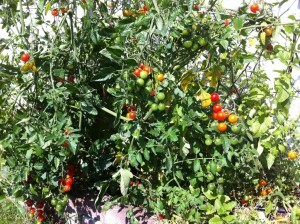 Last summer, I never pulled up our tomato plants. 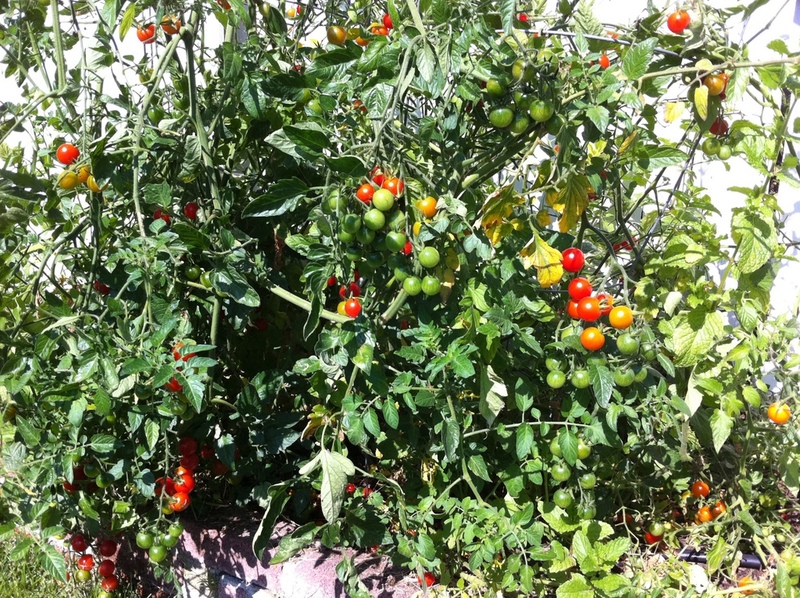 We had 3 or 4 plants in the ground–Sweet 100s, SunGolds–delicious little bites of summer, that bore fruit until October. (It’s like that here, please don’t hate us.) And then we got busy, and it started to rain, and we spent most weekends at one soccer game or another, and I just let those plants go. And guess what? This spring, up popped a tomato seedling. Then two, then three, then six. I didn’t think they would survive, so ignored them. But they kept growing, and I still didn’t really believe what was happening, and so I neglected to thin out the plants. And then, all of sudden, we were back from a month of vacation, the plants were nearly taking over yard, and now we have pints and pints of the best little cherry tomatoes you could ever hope for. They are perfectly ripe and sweet, and we can barely keep up. They plants are a glorious mess, but I don’t care. They just keep producing and producing and all we can do is pick as fast as we can. We give pints away and I am still wrist deep in tomatoes every night. We eat them whole, straight off the plant. I make fresh salsas, with a touch of red onion and cilantro. I make caprese on a stick , or bruschetta, or a modified tomato surprise. I make gazpacho several times a week, which is a dish both kids slurp like addicts. 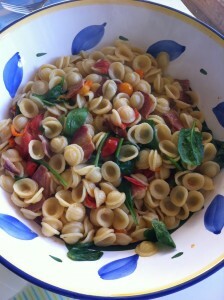 And I’ve made a couple of version of BLT pasta, because we have also been on something of a bacon kick. Cook 4 slices bacon in a pan to desired crispness, remove and drain on paper towels. Chop into 1 inch pieces. If cooking the tomatoes, pour off all but 2-3 tablespoons of bacon grease. Then toss the tomatoes into the pan and cook just until they’re wilted and beginning to burst. Alternatively, slice the tomatoes in half and toss with salt and extra virgin olive oil. Let these sit for about 10-15 minutes while you cook the bacon. When the pasta is done add it to the pan with cooked tomatoes, two big handfuls of spinach or arugula. Toss gently until the greens just begin to wilt. And the bacon and toss. OR, toss the cooked pasta with spinach or arugula until greens are just wilted. Then add the fresh tomatoes and their juices, then the bacon. Serve immediately with shavings of parmesan cheese or the fresh mozzarella.